A writer / adventurer who loves an awesome weekend. The Goulburn Valley is often referred to as Australia's food bowl. 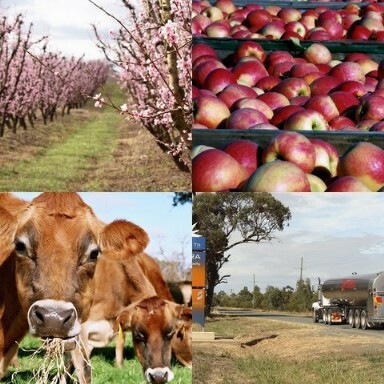 About 25% of the total value of Victoria's agricultural production is generated in the area, encompassing towns such as Shepparton, Tatura, Murchison and Rushworth. Shepparton is a 2 hour drive north of the Melbourne CBD. Whether you are a foodie or someone who is just keen to see where their food comes from, this food tour of the Goulburn Valley is sure to tantalise your taste buds. Included are some non-eating activities to keep the waistline in check and build the appetite. Before you start your trip, make sure you sound like a local. Many of the town names are abbreviated in the Goulburn Valley, for example Shepparton is called Shepp by most locals. Town abbreviations are included in parentheses throughout the article. 1. Bakeries. In an area that produces milk, it is not surprising that vanilla slices are of a high standard. 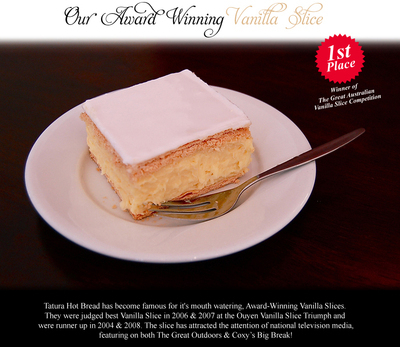 Tatura's (Tat) Hot Bread Bakery is the winner of The Great Australia Vanilla Slice Competition. But I urge you not to just take their word for it. Better yet, get vanilla slices from the Murchison (Murch) Bakery and Rushworth (Rushie) Bakery and conduct your own taste test. Each of the bakeries are well known locally for being good old fashioned bakeries with good bread, sandwiches, pastries, cakes and slices. The coffee at the bakeries is generally of a good standard too, however I would recommend CoffeePlus in Tatura and The Cottage Ice Cream Shoppe in Rushworth for their coffee. 2. Pubs. The Tatura Hotel (formerly known as the Middle pub, due to its central location in the town) has recently been renovated and is well worth a visit for lunch, dinner, coffee or drinks. Since the renovation, the pub has become "the" place in town for locals to meet. There are specials during the week and occasionally live music on Sunday afternoons. If you prefer your pubs a bit less polished, try the Caledonian Hotel in Murchison. 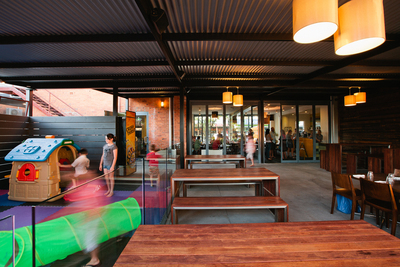 Good food, a beer garden and a pool table set the scene for a good dinner or night out. 3. KidsTown is a must for anyone travelling with children. Between Mooroopna and Shepparton, children will love the "world-class, child-orientated, adventure playground" while parents will appreciate the kiosk and the many sheltered areas to sit and supervise. Entry is by gold coin donation. 4. Scenic orchard drive. Instead of driving along the Midland Highway between Tatura and Mooroopna, keep driving along Tatura's main street (Hogan, becomes Ferguson Road) out of town. Within a few kilometres, you will come across apple and cherry orchards. Many of the trees are supported by V-shaped wooden structures, known world-wide as the Tatura Trellis. The Tatura Trellis was developed locally by agricultural scientists in the 1970s to increase the productivity of the fruit trees. You will also notice the irrigation channels and infrastructure used in the area. Follow the signs to Mooroopna. This drive is especially recommended in Spring - when the blossoms are out - or just prior to Christmas when mouth-watering cherries are for sale (look for signs by the roadside). 5. Explore Rushworth, a town with gold mining heritage and some interesting shops. Just south of Rushworth is Whroo, a ghost town that was once home to 1000 residents. Now it is a place to explore the old mines and enjoy a bushwalk. Back in town, check out the vintage shops, enjoy an ice cream (highly recommended) and walk to appreciate the old buildings. 6. Murchison is a pretty town; the southern approach and town centre makes it worthy of a stop. Have a look at the Goulburn River, have your photo taken with one of the life-size cows (these fiberglass structures are found throughout the Goulburn Valley to celebrate the dairy and beef farming in the area), or cycle along the bike path. 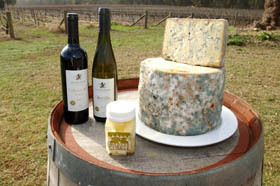 Longleat Winery is recommended; home to Murchison Wines, you can also enjoy locally made cheeses, cakes and coffee, in a lovely setting. 7. Shepparton's Victoria Park Lake has been recently rejuvenated to enhance the appearance and allow it to be used as a rowing venue. Walk a lap of the lake (1.7 km), use the public barbeque facilities and find out why locals love this new-look public space. 8. 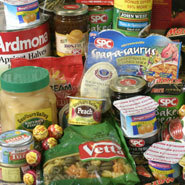 Bargain hunters will love a visit to the SPC Ardmona Factory Sales Outlet. The prices are quite tempting and you are likely to head home with a slab of tinned tomatoes, fruit or soup. The outlet, formerly located in Mooroopna, is now in central Shepparton on the corner of Corio and Vaughan Streets. 9. 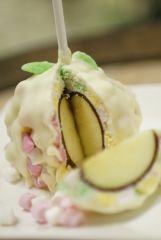 The Chocolate Apple Factory, east of Shepparton on the Benalla Road, is value-adding to their already delicious apples. Available from March to December, flavours include Cherry Ripe, Chocolate Apple Christmas Pudding and Chocolate Apple Rocky Road. See this recent WeekendNotes article for more details. 10. 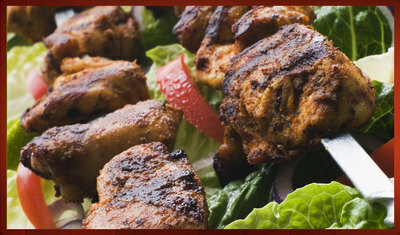 Desi Tandoori Bite is an Indian Restaurant located in King Street Shepparton that is gaining popularity among locals. The décor is not the drawcard; this place is all about great food at reasonable prices. Shepparton is a multicultural city and there are now a handful of dining options for Indian food lovers. This one is a stand out for a casual meal with family and friends. It is quiet for dining mid-week, however a booking on weekends may be wise. BYO wine. Wow. I am off to the Goulburn Valley for a look-see ... and a feed.